After linking portfolios in Stock Rover to brokerage accounts, you may have several unlinked portfolios that you no longer need. 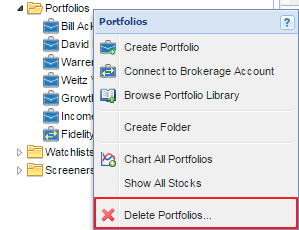 You can individually delete portfolios by right-clicking a portfolio in the Navigation panel and selecting ‘Delete.’ To delete multiple portfolios in one batch, right-click the portfolio folder and select ‘Delete Portfolios…’ as shown below. This will open up a dialog window where you can select the portfolios you wish to delete. You will be prompted to confirm your selections before the action is complete. Deleted portfolios cannot be restored. Deleting a linked portfolio will sever that individual link but will not affect your brokerage connection. See the Brokerage Connections panel (shown above) to manage portfolio linking.